For most people the first day of school (or even work after a vacation) is a big transition and not always a pleasant one. It takes some time to get used to getting up earlier again. Most of us can use those extra minutes of sleep, so for me, the whole idea about a back to school hairstyle is that it’s easy, fairly quick to achieve and still looks gorgeous to give you that extra confidence boost. Part your hair and then grab a section from the top of your head to the top of your ear give or take. Leave out face framing pieces if you like. You’re going to braid a normal 3 strand braid. The only little twist here, is that you leave one of the strands significantly thinner. Be sure to direct the braid towards the back when you’re braiding. Keep braiding until you reach the middle back of your head. Afterwards pull on the strands that are thicker. This will give the braid a slightly more detailed and interesting structure. Repeat step 2 on the other side, then tie both braids where they meat in the back with a clear elastic. You can actually leave it at that if you want to go for a half up half down style. Now take another chunk of hair on the side, below the first braid and repeat step 2 (making a 3 strand braid with one thinner strand). Do this on both sides. Now you’ll pin these braids below the tie back you already made. Bend the braid to hide the ends and the elastic and then use a couple of bobby pins and pin them in horizontally into the braid. Don’t open the bobby pins for a better grip and try to hide them as best you can. 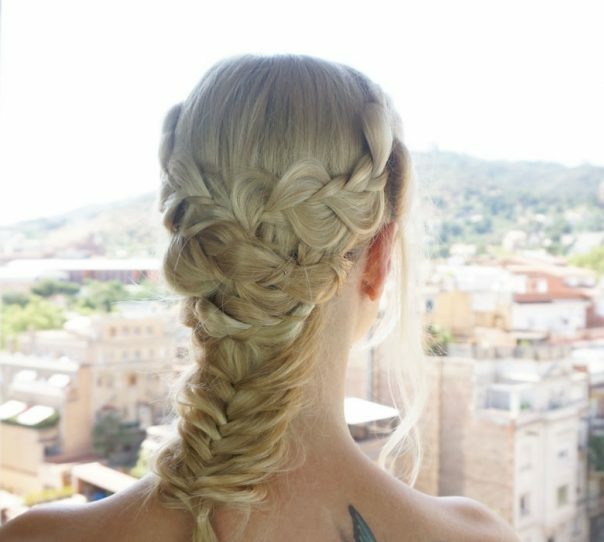 For the rest of the hair that’s left down, you can do a fishtail braid by dividing the hair into two strands. Then take a small piece of the right strand and cross it over to the left one, following by taking a small piece of the left strand and crossing it over to the right one. Keep alternating sides until you get down. Tie the braid off with a clear elastic at the end, but not too close to the ends, leave out two or three inches so that you have enough room to pull on the edges of the braid to make it much more voluminous. I really like the fishtail braid because it’s very forgiving. My hair is on the finer side and there wasn’t a whole lot of it left to braid into the fishtail. I was still able to pull it apart a lot and fake much thicker hair than I really have. No extensions! If your hair is longer and you’re out of time, just do a normal 3 strand braid and pull it apart as well. For more awesome hairstyle ideas, check out Hairs Affairs.